This program is for families with older children and combines the spectacular Victoria Falls with the abundant game viewing of Botswana’s Chobe National Park. Please note that both Botswana and Zimbabwe are Malaria areas so you will need to take anti malaria medication. 2 nights’ accommodation & breakfast at the Kingdom Hotel, 2 nights’ Accommodation in Chobe with all meals, transfers to/from Kasane Airport and two daily safari activities (morning boat cruise and afternoon game drive- one on arrival day and 1 on departure day- full day morning and afternoon activity). Road transfers between Victoria Falls Airport and hotel and Victoria Falls and Chobe game reserve included. International & domestic flights, visas, items of a personal nature, meals not specified. Road transfer from Kasane Airport to Victoria Falls or Livingstone to connect with International flights to Johannesburg on departure. On arrival at OR Tambo Airport (Johannesburg), you check-in for your scheduled flight from Johannesburg to Victoria Falls in Zimbabwe. On arrival at Victoria Falls airport, look out for our representative. They will be holding a name-board with your surname on it. They will transfer you from the airport to your hotel (it will be a shared transfer). This resort-style hotel has taken into account the needs of families, groups, conferences and holiday makers who want a base from where they can enjoy not only the Victoria Falls, but also the wilderness attractions in this extraordinary corner of Africa. The Kingdom at Victoria Falls is the nearest hotel to the world-famous Victoria Falls which are found in Zimbabwe. Children are welcome and maximum two children may share a family room. Children under twelve years pay for meals only. 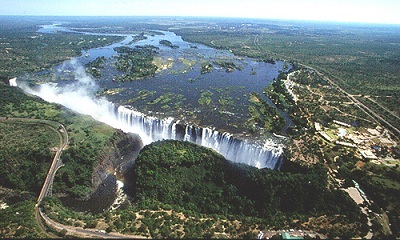 The Victoria Falls is a dramatic scenic contrast and a change of pace from the private game reserves. It is a sight not to be missed - the clouds of spray generated by this thunderous descent have resulted in a lush rain forest full of stunning wild flowers. A host of activities are centred on three separate delights: the Falls, the magnificent Zambezi River and the surrounding Zambezi National Park. Helicopter Flight (Zimbabwe) - The helicopter excursions (colloquially known as the Flight of Angels) are a wonderful way to see the full majesty of the Victoria Falls. You swoop over the Zambezi River and hover over the thundering Falls for a perfect photographic opportunity. Our representative will collect you from your hotel in Victoria Falls. They will transfer you across the border to Elephant Valley lodge on the Botswana side of the boder and the Chobe game reserve. Elephant Valley Lodge is positioned on a frequently-used animal route in the Kasane forest, in an area bordering the Chobe National Park. The camp is surrounded by a perimeter fence, positioned to prevent elephants from walking into the tent area. Instead, the elephants follow well-worn paths around the fence, and may be spotted trundling through the forest. 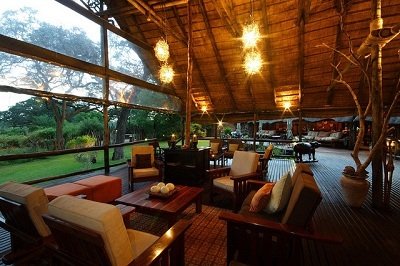 Elephant Valley Lodge overlooks a waterhole in the Kasane Forest Reserve, bordering Chobe National Park in Botswana. The Chobe National Park lies in the northeast of Botswana, teeming with animals, in particular with huge herds of elephant and buffalo. Chobe's animal migrations follow an ancient pattern, only partly understood by man. However, broadly speaking, the game is drawn to the Chobe River during the dry winter season and spreads out to the open grasslands of the Savute marsh and pans during the wetter summer months. 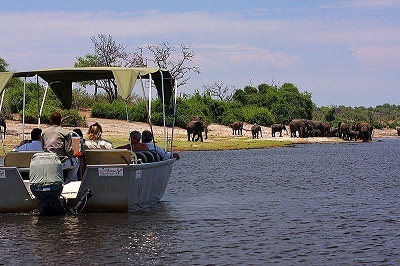 The Chobe/Linyanti river system is known for some of the best elephant viewing in Africa in the winter months (May to October), with huge herds of up to 500 or more at the end of the dry season. Lion are common, and almost expected, with buffalo, cheetah and an amazing variety of antelope often sighted. The river is alive with crocodile and hippo and marvellous birdlife, including kingfishers and bee-eaters. Languorous sunset cruises are a speciality of the area. You enjoy the daily activities at your lodge. The staff from the lodge will transfer you to Kasane Airport where you will connect with your flight to your next destination.